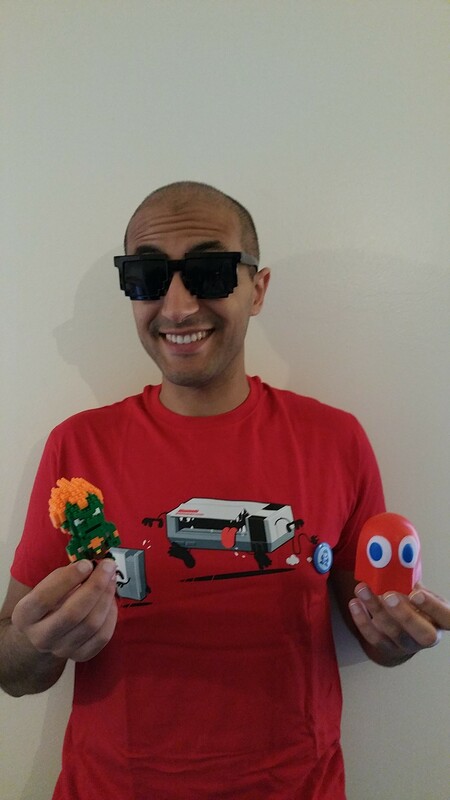 This summer, WOOTBOX sent to all subscribers a special retrogaming box full of awesome retro merchandize products. Not the best time to receive packages when you’re gone for vacation, but who am I to complain, right? And to get the cat out of the bag, yes this is the August Wootbox. And I’ve already got the September Wootbox last week. So, I’ll do my best to get ASAP to the unboxing of the 4th one. With that said, let’s dive into this month’s loot! First of all, I was glad to see that unlike the first two Wootboxes, the postman didn’t just drop my package in front my door or put it on top of the mailboxes at the entrance of the building. Common sense finally struck the French Post Office: the postman left a non-delivery notice in my mailbox and stored my package in the nearest Post Office to my home. I was able to retrieve the parcel the weekend at my own pace. Great! Now, that’s a first improvement I approve of. I’m sure some complaints were made by other subscribers like me who were also annoyed by the way the first two Wootboxes were delivered to them. 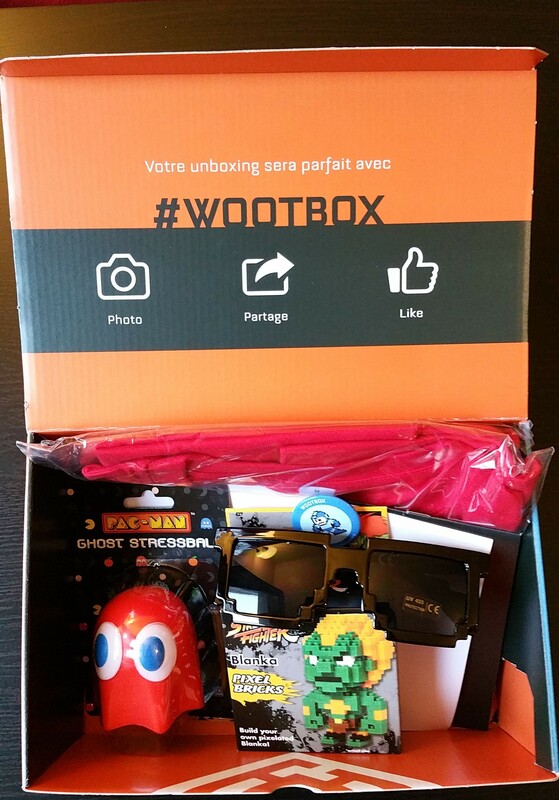 Glad to hear that both WOOTBOX and the French Post Office were listening. 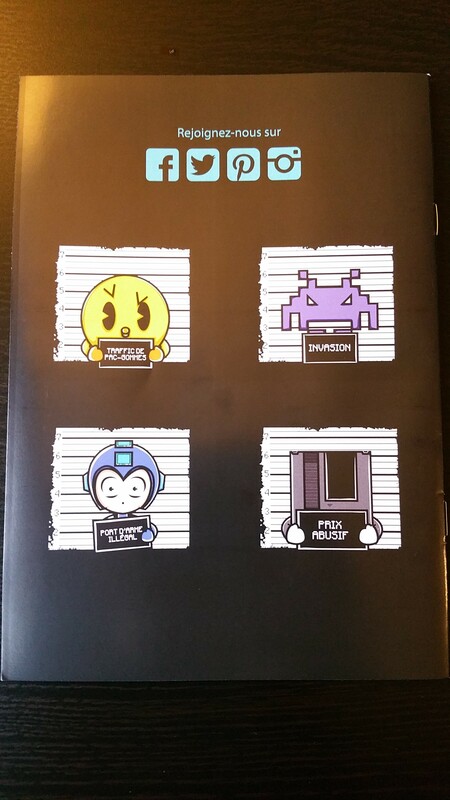 So what’ inside this retrogaming themed Wootbox? 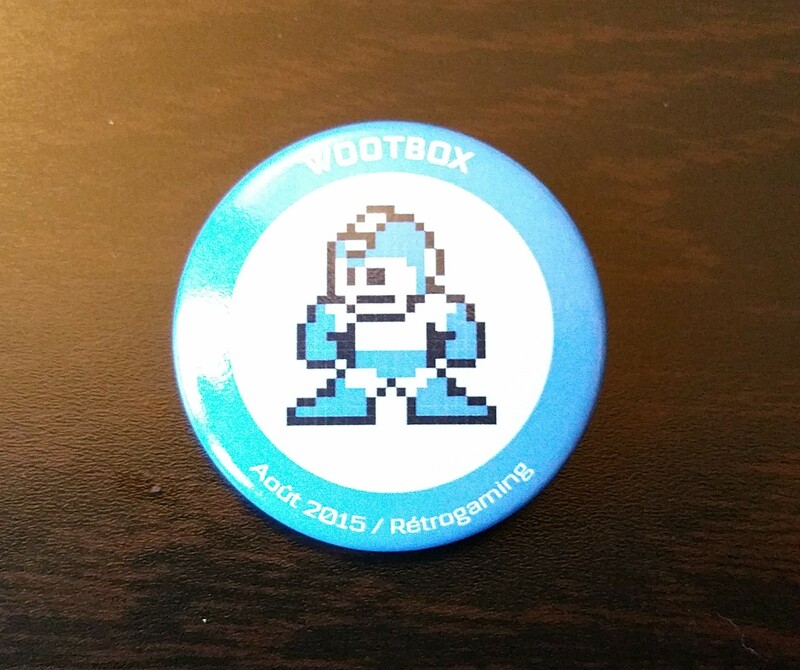 The Blue Bomber is honouring us with his presence on this month’s pin badge. Nothing much to say about it apart from the fact that the quality is always consistent from one badge to the other. 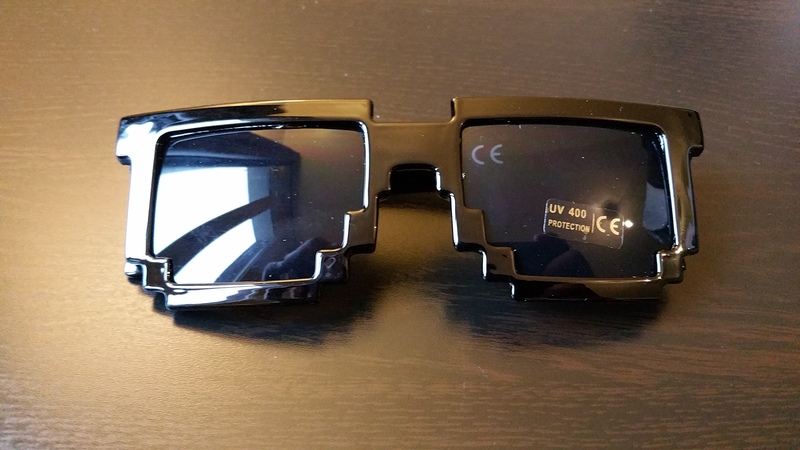 Again, nothing much to say about these sunglasses, apart that they may come in handy if you want to add some 8-bit style to your wardrobe if you’re going to a convention or are invited to some geek-themed party. I got Blinky, the red ghost. 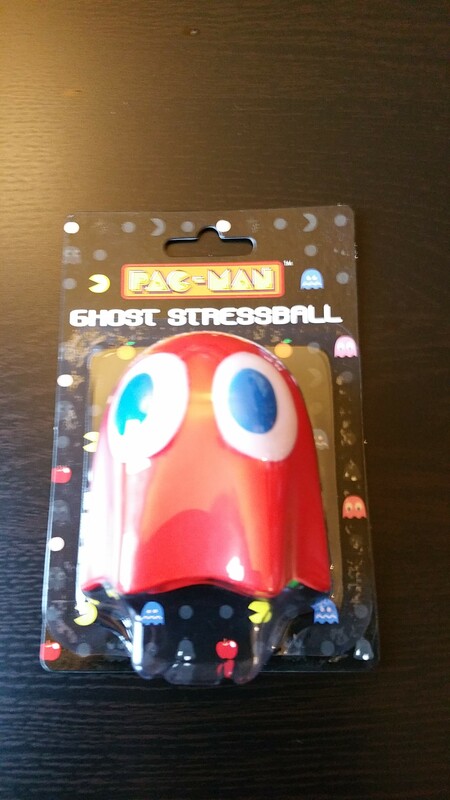 It’s pretty big compared to regular stress balls and the finishing is pretty good for this kind of product. I wouldn’t mind putting this on my office desk, but as a consultant, having a stable office desk is a luxury… Oh well, in the mean time, it’ll stay home with the other figurines and plushes. IMO, this was the best thing we got in this Wootbox. 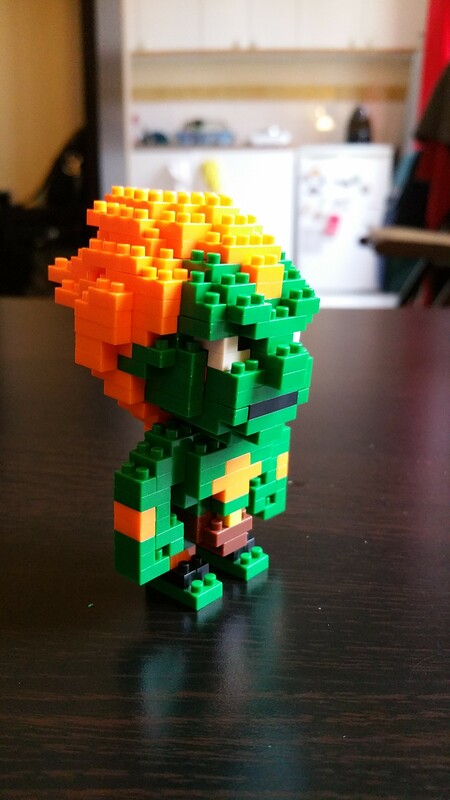 I love this kind of lego-esque/8-bit like figurine. 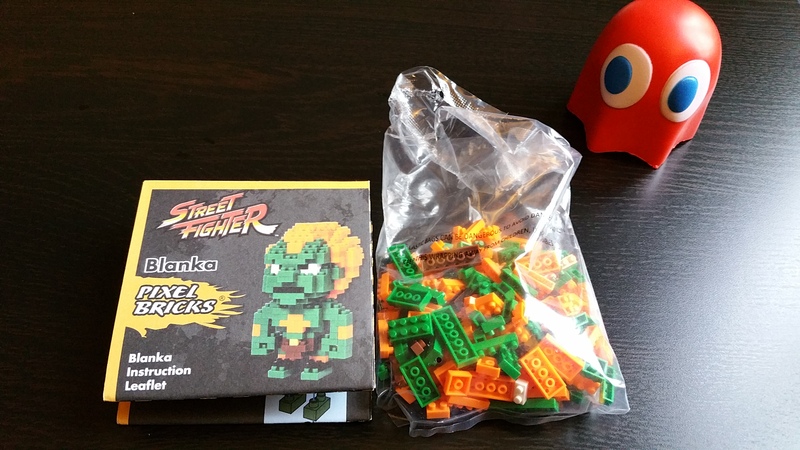 As you can see from the pictures, I got Blanka from Street Fighter, but other subscribers got Ryu, Ken, Sonic or Tails. 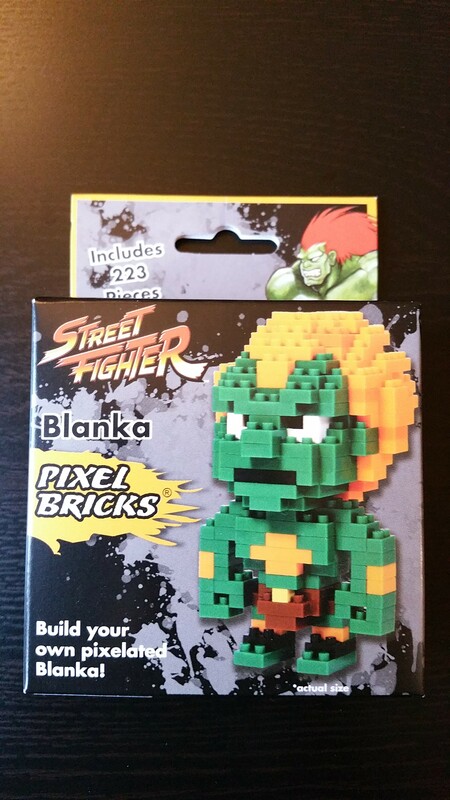 I know it’s nitpicking, but I would have preferred Ryu, Ken or Sonic instead of Blanka. One thing I should address is how little the bricks are. These are like half or a third of the size of regular Lego bricks. In one of the pictures, I put my finger next to one brick so you can really understand how small theses pieces are. 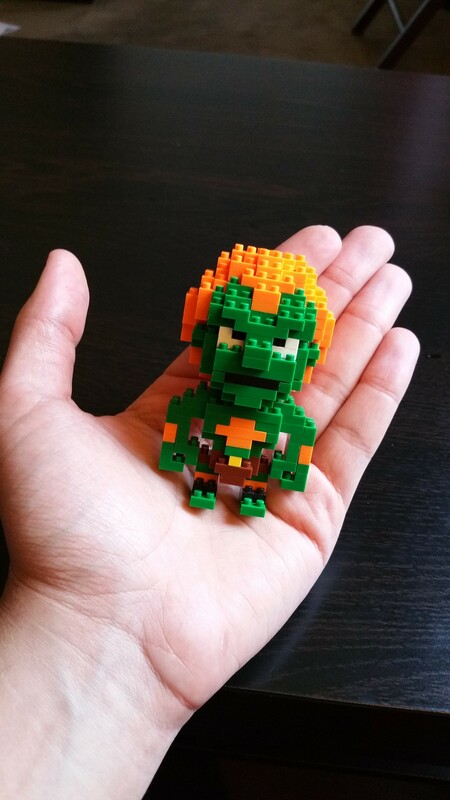 I won’t lie, but building the Blanka took me around an hour and a half. 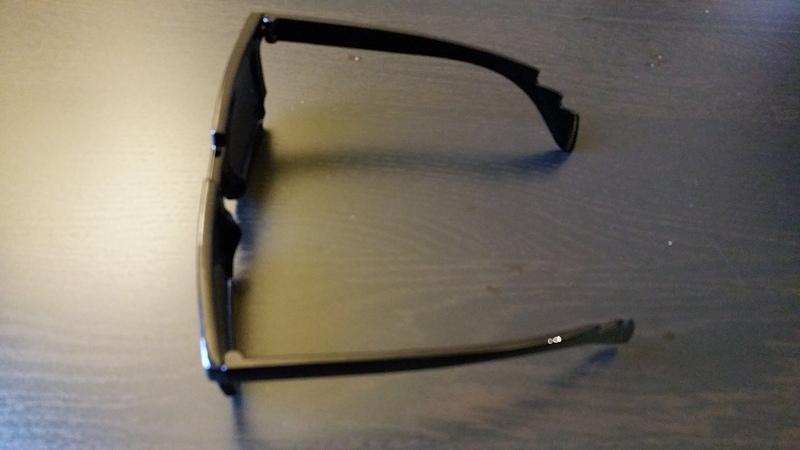 Not only the size, but the instructions were also not that helpful. It’s like IKEA decided to make Lego-Brick furniture. Each step have you build 2 to 3 layers at the same time, while letting you deduce on your own how to place each brick on or under another brick. I had to redo some steps a couple of times, so that Blanka wouldn’t look like a deformed clone a la Ripley from Alien 3. Still, like I said, it’s a great addition to my collection and I didn’t regret any single minute spent into building this figurine. The result is worth the effort! 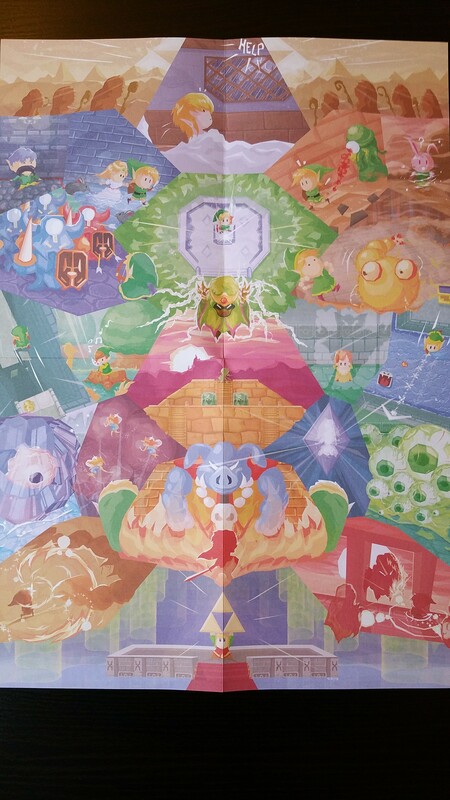 It’s a great looking poster. The colors are what really makes it appealing to the eye. Key scenes and/or locations in the game are represented and I can’t wait to move in my next flat to stick it to the wall. 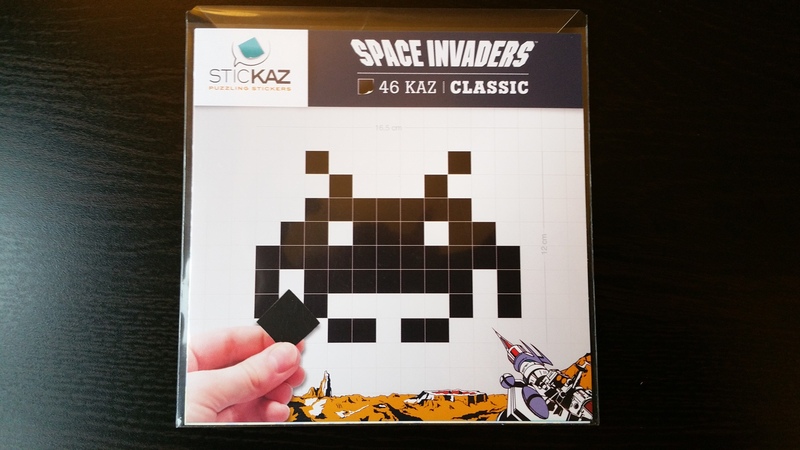 Space Invaders is a kind of no-brainer when you think video game pixel art. So, it’s cool that we had something as iconic as the “crab” alien from Space Invaders. 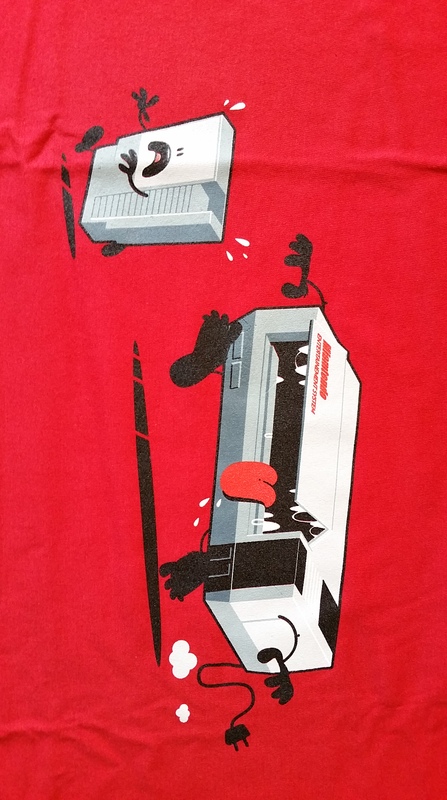 While I was disappointed by the Game of Thrones tee-shirt in the first Wootbox, I was glad to see they picked an overall better one for the retrogaming themed month: better quality, better cut and better design. As you can see above, I have all the stuff to look rad while playing Sonic the Hedgehog on my Sega Megadrive. EXTREME 90’s retrogaming FTW! The magazine is back with issue #2. You will find the same kind of content that was already found in the first issue. 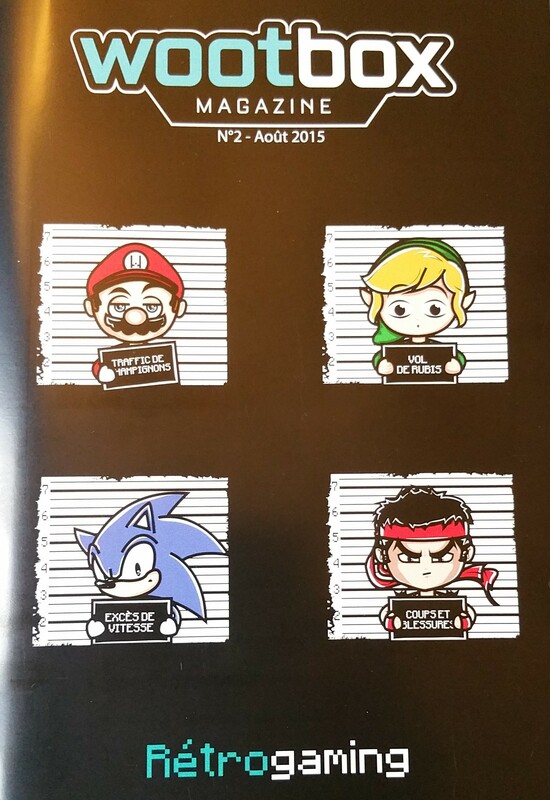 But I found the cover to be pretty awesome with cool mug shots of some of our favorite video game protagonists. Really nothing much to say on the negative side. 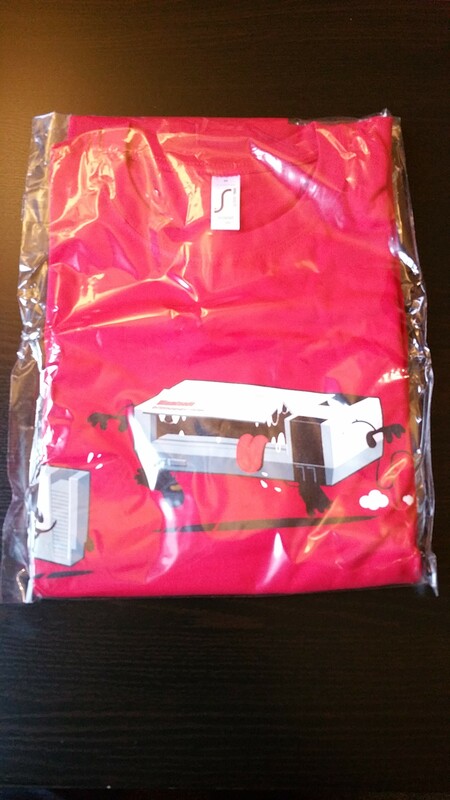 If I had to nitpick, I would say that the delivery was a little bit late by a couple of days. But really, that is all I had to say. I honestly think that this is the best Wootbox so far. Every single item found in the box is consistent with the theme and really strikes a chord for every gamer that grew up in the 80’s and the 90’s. This genuinely feels like a box made for gamers, which wasn’t really the feeling I had with the previous ones. If Jeuxvideo.com kept having other boxes as good as this one, I’m sure that the subscribers base will grow larger and larger in no time. Thanks again for passing by and reading this post. Next month’s Wootbox theme will be Adventure. So stay tuned and see you soon!